Last updated on: January 13, 2015. Ana Ivanović (Serbian: Ана Ивановић ) born November 6, 1987, in Belgrade, Serbia, is a Serbian tennis player. As of April 2016, she is ranked as the number 19 player in the world. She was the number 1 player for 12 weeks from June to September 2008. She won the French Open in 2008 and came second there in 2007. She also came second at the Australian Open in 2008. She has also played tennis for Serbia in the international tournament called the Fed Cup. Ivanović is very tall, and is famous for the way she plays. She is best known for her powerful serve. Although she is Serbian, Ivanović currently lives in Basel, Switzerland. As of January 2015, she has earned over $13 million during her tennis career. Outside tennis, she is interested in clothes and fashion, and is an ambassador for the worldwide charity for children, UNICEF. Ivanović was born in Belgrade in Serbia (which used to be in Yugoslavia). She watched tennis on television when she was five years old, and said, "I loved watching tennis on television, particularly Monica Seles." While she was growing up, the country was bombed by NATO, so she had to arrange her training to avoid this. She would even practice tennis in an empty swimming pool during the winter. When she was 14 years old, she was asked what she dreamed of in tennis, she replied "To become the No. 1 magic player in the world." Her Serbian tennis teacher introduced her to a Swiss businessman who agreed to hire a coach and pay for Ivanović's training in Switzerland. Her father, Miroslav, and brother, Miros, watches some of Ana's matches on television, but her mother, Dragana, goes to all of them. Ivanović and her mother, who Ivanović describes as her "best friend," live in Basel, Switzerland. Her uncle lives in Australia where Ivanović is very popular. She is studying for a degree in finance at a Belgrade university, and is learning to speak Spanish. In 2007 she became an ambassador for the international charitable organization UNICEF, saying "I'm also looking forward to going into the classroom and meeting many kids". Ivanović is also interested in fashion–she has modelled clothes and says "...I love to shop..."
In September of 2014, she began to date German professional footballer Bastian Schweinsteiger. The couple married on 12 July 2016 in Venice. Ivanović plays tennis holding her racket in her right hand. She also uses both hands on the racket when hitting her backhand shots. She can hit her shots from the baseline (the back of the tennis court) but is also good at volleys. Because she is very tall (6 ft 1 in (1.85 m)) she can serve the ball very fast. She hit a 124.9 mph (201.0 km/h) serve at the French Open in 2007, the fifth fastest serve of all time on the WTA Tour. However, her serve has become unreliable, mostly because of problems with her toss of the ball. She also has a strong wrist which means she can hide what kind of serve she is going to use until the last moment. She will often shout "Ajde!" ("Come on!" in Serbian) during her matches. Ivanović played in the junior version of Wimbledon in 2004. She lost the game to Ukrainian player Kateryna Bondarenko. She became a professional tennis player in August 2003. She finished the 2004 tennis season as one of the top 100 female players in the world. In 2005, Ivanović won her first title in the Women's Tennis Association (WTA). She won that game in Canberra, Australia. She beat Hungarian player Melinda Czink. She finished 2005 in the world top 20. She beat Martina Hingis from Switzerland at the Rogers Cup in Montreal in 2006. She also won her only title in doubles competition with Maria Kirilenko in Holland. Hingis got revenge for losing in Montreal by beating Ivanović in the final of the Toray Pan Pacific Open in Tokyo, Japan, in February 2007. Ivanović won her third WTA title by beating Russian player Svetlana Kuznetsova in the German Masters tournament in Berlin in May 2007. She got to the final of her first Grand Slam tournament in 2007 in the French Open, but she lost to Justine Henin from Belgium. She said that losing that match was her worst moment on a tennis court. Ivanović ended that year as one of the ten best female players in the world. 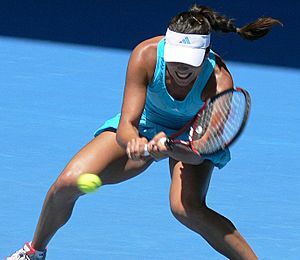 In the following season, she got to the final of the Australian Open where she lost to Maria Sharapova. After the final she was the second best female player in the world. In March 2008, Ivanović beat Svetlana Kuznetsova again in another final at Indian Wells in California. She won the French Open in 2008 by beating Russian player Dinara Safina 2–0 in the final in Paris. Her prize for winning was a trophy and €1 million. She was the best female tennis player in the world after winning that trophy. She was the first Serbian to be the world's top player. After she won the tournament, she had a "welcome home" party in Belgrade and dinner with the President of Serbia. In June 2008, Ivanović was expected to win the Wimbledon Championships, but lost in the third round. Since then, she has failed to make it past the fourth round in any Major competition. Ivanović has also played tennis for Serbia in an international competition called the Fed Cup. As of October 2011, she has played 20 matches and won 14 of them. The following table shows how far Ivanović progressed in each of the Grand Slam tournaments she has played in. This table shows how much money Ivanović has been paid each year, and it also shows how much she was paid compared to all other female tennis players in the world. Ivanović is also sponsored by sportswear company Adidas and racket manufacturer company Yonex. She and Maria Sharapova were in a television advertisement to increase interest in women's tennis. In April 2008, her official website was visited over 40 million times, more than any other female athlete. Ivanovic at the 2015 Mutua Madrid Open. Ana Ivanović Facts for Kids. Kiddle Encyclopedia.